Below are listed some of the great sites that we have referred to while planning this trip. I can’t tell you how many times I would wake early in the morning (like, 4am early) wondering about some random part of our trip. I’d start pondering things like, ‘why do some tow bars have a square hole/connection/thingy, yet others have a tow ball?’ I’ve only ever used (or seen used) a trailer that sits on a tow ball. Huh? And so I’d get up and start having a look. And it’s because of those early morning sessions that this Resources page has come about. These are the sites that I found to be the most helpful, with specific information and organised in a clear and logical way. For a comprehensive guide to towing, covering all the parts of a towing set-up, how to figure out weights and brakes, and how to tow safely. I was going to do all the research and put it into one monster post, but The National Caravan & Recreational Vehicle Towing Guide does a way better job than I could ever pretend to do. And you know it’s from people that actually know what they’re talking about. I recommend that you download the ebook as it seems to have a bit more information and is laid out better than the website. Go and learn from the masters here. I’m hearing this all over the place, that WikiCamps is THE place to go for camp ground information. It’s an app that you can download for iOS, Android or Windows for just $7.99. It shows all the campgrounds (including free ones) along with comments and updates from other users. I’ll definitely be getting this app when we get to Australia. 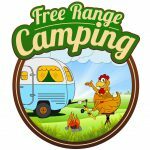 Another website, which is specifically Australian is FreeRangeCamping.com.au. It’s free to register and it looks like it has a very large (and continually growing) directory of campsites and other accommodation options. They also list local businesses, rest stops, dump points and so forth. I’ve registered now and will have a good look through it, but it looks like this is going to be an excellent resource for our trip. Okay, so this website is HUGE and contains so much information about 4 wheel driving that I think it’s fantastic for newbies (that would be us) but also really helpful for the more experienced drivers. Run by father and son duo Brian and Ronny Dahl, there is gold in these pages. While they’re based in Western Australia, the principles of 4WD aren’t state specific! If you’re looking to do any 4WD on your trip then I think this is a great resource. For us, we’re not looking at going hard-core off-road (not at first anyway) but we want to buy a 4WD so it was on this site that I learnt stuff like; whether manual or auto is better, the difference between 4WD and AWD, and whether petrol or diesel is better. Check them out at: 4-wheeling-in-Western-Australia.com. Ronny also has an associated YouTube channel where he talks through heaps of the helpful stuff, so look out for that link on their website. I’m not gonna lie, this site is not what you’d call ‘easy on the eyes’ and it’s a bit of pain to navigate, but… it’s got the info, and that’s the most important thing, right! It’s run by a group of camper trailer enthusiasts and they have a membership (yahoo group, forum, facebook group); I haven’t asked to join up yet, but it looks like they have lots of get-togethers, sharing help and looking out for one another. Go to the page ‘Tech Tips‘ to get a list of all the helpful articles. I was especially glad for their checklist of what to look out for when buying a camper trailer (either new or used). Oh, and they’ve got a section of camper trailers for sale. Yay! 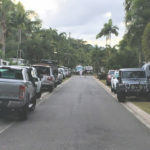 Where the CamperTrailers.org site above is a more amateur, community minded kind of site, the Camper Trailer Australia site is like an online magazine. 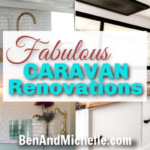 They review lots of camper trailers and caravans, have travel destination articles, competitions (yes please, I would definitely like to win that brand new Mars Extreme Deluxe Hard Floor Camper Trailer!!!) and they’ve got a Buy & Sell directory. They’re a pretty slick operation, I gotta say. 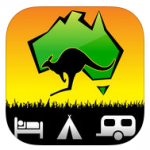 The Travel Outback Australia site is perfect for planning any outback travels. 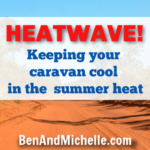 Based in Alice Springs, Amanda and Gary’s site has loads of helpful (vital, actually) information about staying safe in the outback; as well as destination tips, itinerary guides and product reviews. This is the area that has probably caused us the most grief! We bought a compressor fridge, a new battery, an inverter and a solar panel. And then we bought another battery, and then ANOTHER battery. And then we added a solar blanket. Finally, I think we’ve got enough batteries (and solar to recharge them) to keep our fridge cold, our lights on and our computers and phones charged. Note: We bought most of our setup from SuperCheap Auto and we got fantastic service from them. I think we visited every SuperCheap Auto between Port Macquarie and Townsville and at each franchise the guys were SUPER helpful, I will not fault them at all on their service. However, they sell a myriad of products, of which 12v components are only a small part. They are not experts on the topic, so they were not able to advise on our total setup. That’s why I recommend you go straight to the experts like Offroad Living. Oh, and all the fellow travellers who will tell you what you ‘should’ be doing as you’re sitting around the campfire at happy hour? Yeah, just smile politely and promptly ignore their advice. They’re experts on their own setups but don’t know all the ins and outs of your needs. ‘kay, nuff said on that topic. As you can see, we’re blogging about our trip. 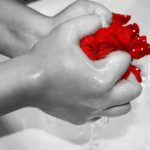 This section is not going to be relevant to many of you, but for our fellow bloggers, you may like to know what resources we’re using for this blog. Disclosure: There are some affiliate links below and I may receive commissions for purchases made through links in this post, but these are all products I highly recommend. I won’t put anything on this page that I haven’t verified and/or personally used. Please see our disclosure policy for more information. For our hosting we use Wealthy Affiliate. The reason we use Wealthy Affiliate is that they’re a one-stop-shop for your domain, hosting, site backups, site security and lots of other things (stuff that I haven’t really looked into, to be honest). But, in my opinion, the beauty of Wealthy Affiliate is that they have heaps of tutorials for setting up your website AND how to monetise it. It’s called Wealthy Affiliate because they teach you how to make money through affiliate links on your website. As I said, there’s heaps of tutorials, but there’s also a very active members forum and you can ask as many questions as you like. We’ve been really happy with Wealthy Affiliate, if you’d like to check them out, here is our link where you can sign up for a free account and have a look around before deciding if it’s right for you. The email marketing tool we use is GetResponse. While it’s not one of the fancy, popular ones at the moment, we’ve been with GetResponse for a few years and have been happy with how it works. It doesn’t have all the bells and whistles of some of the other email marketing tools, it also doesn’t have the fancy price tag. We’ve been very happy with it. Pinterest is one of our top ways of getting traffic to this blog. To help me manage the Pinterest account I use the only Pinterest-approved scheduler, Tailwind. Once I took the time to figure out how the scheduler works (and there’s heaps of videos online that walk you through it) I realised just how easy it is. Add to that the Tribes feature, and the detailed analytics (THE most detailed analytics you’ll find… even Pinterest itself doesn’t have analytics this good) and it all combines to give you a powerful scheduling tool. Oh, and Tailwind also schedules to Instagram. Win win, in my book. If you’re already got a domain, then you don’t need to worry about this. There are heaps of domain suppliers and as far as I can tell, they’re all same, same. We use Namecheap.com. We probably started using them because they had a deal on cheap domains, but kept using them so that we could have all our domains in the same place. But you could try GoDaddy, Crazy Domains, Net Registry or any number of suppliers. Just a note, if you want an ‘.com.au’ domain name you need to have an ABN. We don’t so that’s why we’ve gone with just ‘.com’, it makes life easier.